FIFA 19 continues the storyline first introduced in FIFA 17 for its single-player story campaign. It's called The Journey: Champions, and sees Alex, Kim, and Danny each trying to make it in their respective positions. Players get to play as all three, switching between the three to continue the story. Just like in previous campaigns, there are key decisions to make, rewards to earn, and matches to play. To make sure you're making the most out of The Journey: Champions, we've put together this FIFA 19 The Journey Guide. We'll give you some essential tips and tricks to get you started, and collect all of our FIFA 19 The Journey Guides Content in one handy place. For more on FIFA 19, be sure to check out our FIFA 19 Guides. We've got info on all aspects of FIFA 19, including FUT 19, a look at the best young players, and more. Can You Play as Danny Williams and Kim Hunter in FIFA 19 The Journey Champions? How Long is FIFA 19 The Journey Champions? Should You Play Solo or As the Whole Team in FIFA 19 The Journey? Can You Change Position in FIFA 19 The Journey Champions? As we mentioned, the headline feature in FIFA 19 The Journey is the ability to play as Alex, Danny and Kim. With EA securing the UEFA Champions League license this year, that prestigious tournament also features prominently in the story. We've pulled together a handful of FIFA 19 The Journey guides each covering a seperate part of FIFA 19's campaign mode. Check them out through the links just below, or read on for tips. While last year's game featured sections where you could play as Danny and Kim, FUFA 19 The Journey takes that one step further by letting you switch to their journeys at any point. 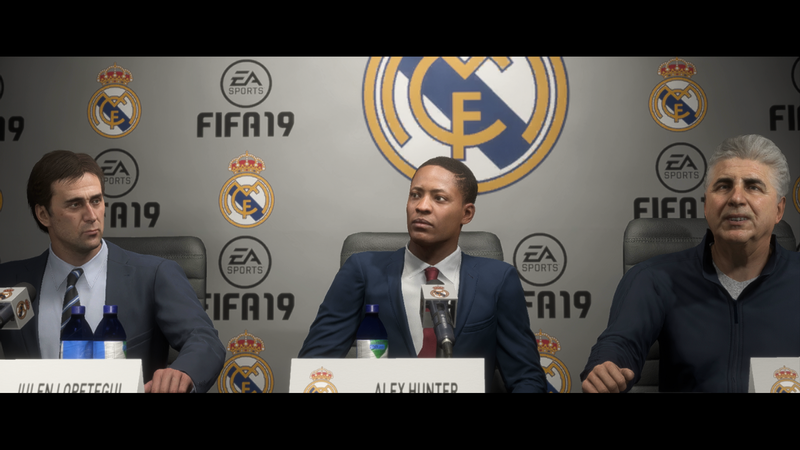 Alex Hunter is still the start, although perhaps the most annoying of the three, so he still gets the most time in the spotlight, but you could run through all of Danny's story if you'd prefer - once the opening chapter is completed. We wouldn't recommend that option, though, as there is a recommended path that makes the most narrative sense to take. The FIFA 19 The Journey hub screen highlights the player switch menu if it's time to switch characters when EA has deemed it the right time to do so. Once again, FIFA 19 The Journey Champions is a pretty hefty campaign to play through. Depending on whether you play through all training exercises (and you absolutely should), the story can take up to 20 hours to complete, and that’s before you factor in time spent customizing and interacting with social media. While it's tempting to simulate training drills, especially when you find yourself doing the same ones with each character, it's very rare you'll progress your skills as much by taking this route. High ratings earn you more stat boosts, and simulations often result in D, E, or F ratings. Play as the individual player, not the team or mentors option. This will ensure you are focused on your positioning and definitely goes a long way to improve the realism of the experience. Playing as the whole team can often mean Alex, Danny, or Kim don't get much of a look in. Spend your Skill Points. You’ll earn them by completing training when playing as Danny and Kim, and they can make a big difference in a match. Alex is meant to be more of a finished article, so he doesn't earn skill points, but can see improvements through training drills. Don’t worry too much about the dialogue options. While one will get you more followers, and the other more standing with the Manager, it doesn’t really make a whole lot of difference in the end. Don’t simulate training, it could easily kick you out of the starting XI and you'll miss out on improving your overall skills. Hold L1 to automatically reposition your player into the ideal position. If you stay out of position for too long your match rating will drop. Hold R1 to order the rest of your team to press the opponent with the ball. Try not to call for passes in bad positions, players will favor passing to you if they can, so just get into space and you’ll be fine. If you’re mostly playing for the narrative experience, then don’t be afraid to dial the difficulty down a tad. Be careful with tackling. A mistimed tackle is an easy way to see your live match rating drop. With every match in FIFA 19 The Journey Champions, you get the option to either play as the entire team or as just Alex, Kim, or Danny. And while it’s certainly easier to score goals as a team, you should be more focused on your individual Player Rating. Obviously it is up to you, but we’d recommend sticking with just one player. It adds to the realism of the campaign, and can avoid any situations where the AI will negatively impact your performance. When given the chance to play as mentors and partners, avoid at all costs, as it is seriously confusing to control. While completing training drills with either Danny or Kim, you’ll build up Skill Points. These can be spent in the Attributes menu. 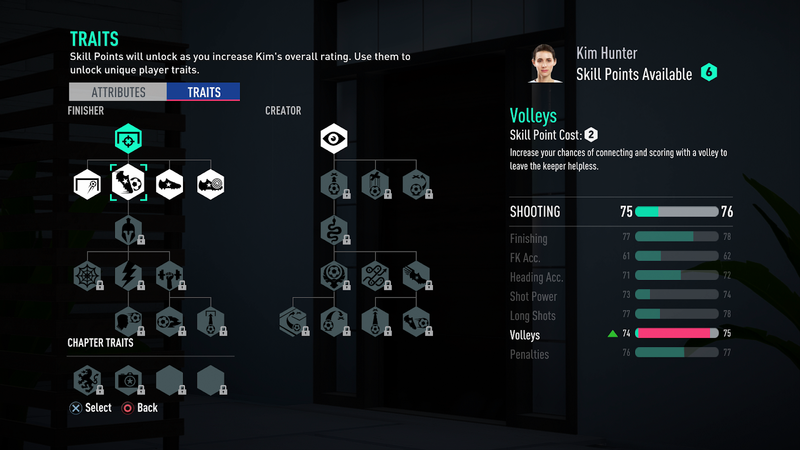 You can choose how to progress through the skill tree, with each point upgrading a specific attribute. Don't forget to use these. It's an easy thing to miss and Alex doesn't have Skill Points this year. FIFA 19 The Journey sees you taking on the role of one of three football stars. You play specific characters, each with their own backstory, play-style, and position. As a result, you cannot alter the position while playing The Journey: Champions. You'll play as an attacker in all three campaigns, though each team will have its own formation. It's important to play in the position assigned to each character, as you'll lose points for falling out of line.